When you shop for Toyota parts and accessories at Arlington Toyota, our well-trained staff will help you select the right OEM part for your car or truck based on the manufacturer’s recommendations for your vehicle. Fact is, we have one of the largest inventories and most competitive prices on Toyota parts anywhere in North Florida or South Georgia. And, our state-of-the-art Parts Department uses the latest technological advances to make sure you get the right part for your Toyota Camry, Corolla, Highlander, Sequoia, Tacoma and other models. Make your car or truck like new again with factory authorized parts. Family Owned and Operated for 35 Years Arlington Toyota is Jacksonville’s family owned and operated Toyota dealership since 1978. For the past thirty five years, our doors have been open to the public providing a true, no non-sense buying experience and straight forward service department that relies solely on genuine OEM parts. Don’t go anywhere else. Arlington Toyota is famous for delivering the highest level of customer-focused service. That’s how we won the Toyota President’s Award in 2001, 2002, 2004, 2005, 2006, 2008, 2009, 2010 and 2011. You never have to shop for replacement parts for your new or certified pre-owned vehicle at discount parts stores ever again. Get the service you deserve from North Florida’s leading dealership. Arlington Toyota Parts Department is located onsite at 10939 Atlantic Blvd and our team of professionals is ready Monday through Saturday to help you find any item you need. Give us a call at (904) 201-1145 or use this website’s OEM Parts Request Form and we will do the leg work for you. 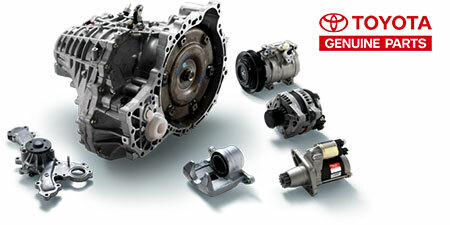 Let our team of parts professionals prove that your patronage is highly valued at Arlington Toyota. It is always our goal to provide the highest quality parts and service for repairs and maintenance of your vehicle. We deliver the highest level of customer satisfaction, that customers have grown to expect from Jacksonville’s leading dealership.